After 3 days on the move and paddling around 40 nautical miles, the middle day of our adventure was a rest day of sorts. Using the Toba Inlet camp as a base for a whole day, we woke and ate breakfast without the usual hustle, and launched without having to pull down our tents just after 10am. Our destination was deeper into Toba Inlet, with no set itinerary or plans other than to experience the thrill of paddling into the mountains. Huge granite cliffs plunged on both sides straight into the turquoise waters of the fjord, and every corner we turned gave us a new perspective of the rugged Coast Mountains we had come to explore. Already, as early as it was, we could feel the first breath of wind being pulled into the inlet by the rising temperatures of the day. These sea breezes – or anabatic winds – are prevalent amongst the coastal inlets of British Columbia. With the warm air over the mountains rising in the heat and being replaced by the cooler ocean air from the west, these winds can easily reach over 25 knots on an otherwise calm day and create wind waves in Toba of over 6 feet! While for now it was still just a nice breeze at our back, we paddled along the steep cliffs and came underneath a cascading waterfall that dropped from a glacial lake many hundreds of metres above – not quite as thunderous as it would have been in May, still a impressive sight in the mid-summer heat. After paddling a little further into the inlet and taking pictures underneath the silent and majestic peaks, we turned back a with a small pang of regret and made our way back to camp into the building wind. Using the varied shoreline as cover to get out of the gusts as they funnelled up the centre of the inlet, we comfortably returned to camp in time for a late lunch and some relaxing swimming and reading on the beach, content in the knowledge that more good days of paddling remained on the loop home. We were on the move again on day 5, crossing the mouth of Toba Inlet just after 10am and entering Homfray Channel for our long return journey to Desolation Sound. One guest was overheard over breakfast lamenting that the mountain scenery was all behind them starting from today, and Kyle and I smiled in the knowledge that there were still many breathtaking mountain vistas to come on another perfectly clear and warm day. We were making great time as we entered Homfray from the north. Our guests were by now supremely confident and comfortable paddling for extended periods with efficient strokes that they could continue all day long. There wasn’t a ripple on the water, our only enemy was the beating sun, that we know would increase in intensity as the day went on. We paddled past Atwood Bay on the mainland side of the channel in serene conditions, idly chatting away and enjoying the mountain views. Iconic Mount Denman looked much different but no less spectacular from this direction, rising jaggedly above our heads. Suddenly Kris, one of our guests, stopped mid conversation and stared into the distance. We all exclaimed in disbelief as a massive humpback whale came up in the distance, its entire body almost leaving the water and becoming airborne down towards the mouth of Homfray Creek in front of us. We came together and waited, seconds ticking slowly and breathlessly by. And then again, on more time, the giant repeated its breach after what seemed like an eternity, but was probably only 15 seconds, as we waited and held our breath. We all whooped and hollered and the whale – or whales, as we could now see that there were two of them – began moving in front of our path towards the middle of the channel. For 25 minutes the group sat together, rafted up in silence, taking photos and watching the slow drift of the whales north as they came up together for air, one by one, over and again, before they were long out of sight, and we returned to the paddle ahead. We had lunch in a nice bay at Homfray Creek, and then jumped back in the kayaks and continued south past Homfray Lodge. 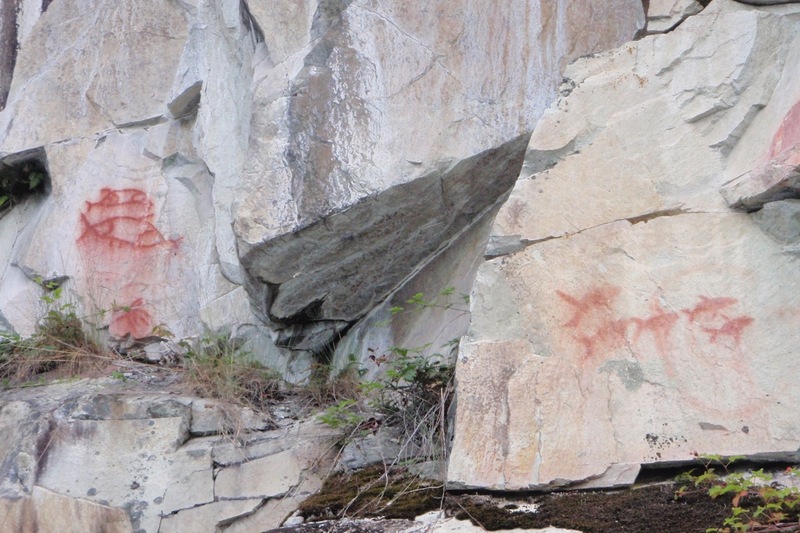 High up on the rocks just north of the lodge you can spy old pictographs created in a time long past, and we sat and admired them and tried to interpret their meanings amongst ourselves. On our left we paddled beyond Forbes Bay and Forbes Creek, directly below Mount Denman itself. The day was getting on and the sun was hot in the sky, and we could feel the energy of the group slowly seeping away. Finally we reached our goal: a beautiful campsite that looked both north up Homfray Channel to the mountains had left, and west down beyond Desolation Sound again to the rugged spine of Vancouver Island far beyond. It was a wonderful point of land shimmering in the golden afternoon light, and our guests took to the water and swam in the warm ocean temperatures as Kyle and I prepared dinner and appetizers under an incredible Maple tree that reached it’s arm like branches out and over the sea. The day dawned hot and bright again, and we prepared for our return to Desolation Sound. We had planned the Mountains Tour to avoid Desolation during the August long weekend, and now hoped to return to the Sound at the tail end of the busiest weekend of the year and avoid most of the crowds. We paddled south along the final mainland potion of Homfray Channel. As we came upon Prideaux Haven – an area renowned as a busy and popular anchorage for sailors and yachts – we could see a number of boats coming and going from the sheltered cove. Passing by along the northern edge of the anchorage, we avoided the traffic jam and then cut in amongst the islands and bays on Prodeaux haven’s western edge, before deciding to continue on and land on the idyllic Curme Islands before lunch, thus giving us all an extended afternoon of rest and relaxation after some long and rewarding days on the water. The Curmes are popular with kayakers, especially in August, but we arrived early enough in the day to claim the entire southern Curme Isle for ourselves. As the afternoon dragged into evening and the sun began to set in hues of orange and yellow and red over Mink Island to the west, there was plenty of swimming and even some self-rescue practice by some of our more committed guests! Finally the day ended and we all started to head to our tents, only for another cry to be heard in the night. Kyle had gone down to clean one last dirty dish in the dark and had discovered that the magical, glowing lights of bioluminescent plankton were dancing beneath the surface of the water. We lingered for half an hour or more as sticks and rocks and eventually a few brave guests went into the water and swam amongst the glowing lights, before we all eventually made our way to our tents for the final time on this grand adventure. We didn’t rush on our final morning, and after getting on the water just after 10.30am we crossed in more perfect conditions to the south shore of Mink Island and paddled all the way to the western point, before crossing back into Malaspina Inlet and the final stretch towards home. The current was rushing into the inlet as we approached, and we relaxed and let the surge of inflowing water carry us almost effortlessly towards our lunch spot in Grace Harbour. After one final meal together upon the bluffs overlooking Okeover Inlet to the south, we silently made our way to Penrose Bay and our launch site, vaguely recognizing the sites we had seen on the first morning of the trip a week ago. Civilization returned as we closed in on home: first vacation homes on the inlet, then the sight of kayakers looming up in front of us and leaving Okeover for the start of their own journey into Desolation Sound, and then finally we turned the corner and entered Penrose Bay and our destination was in sight. Friendly staff from PRSK came down to hail us and help us with our kayaks and gear, and in no time we were all standing on the shore and packing our vehicles and saying our goodbyes. After being threatened with storms of wind and rain in the lead-up to the tour, this turned out to be some of the best paddling weather we experienced all summer in Desolation Sound! 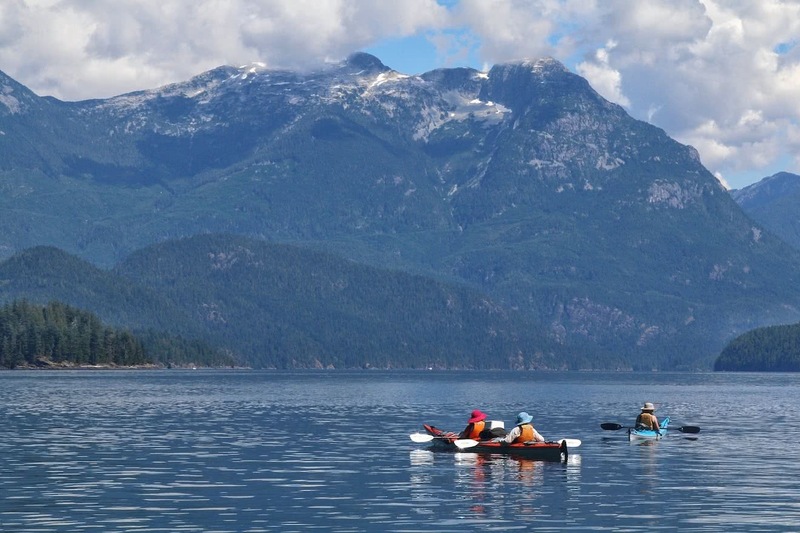 With a group of committed guests – with fantastic attitudes – that were all eager to learn and experience this special area of the BC mainland coast, this 7-day Mountains Tour was a highlight of the season for us here at Powell River Sea Kayak. For more information about out 5- and 7-day kayak expeditions, please click through to our Expeditions page on this website! Desolation Sound is world famous for it’s remarkably warm ocean temperatures, which routinely reach 22 degrees celsius (74 degrees Fahrenheit) during those long, hot summer days of July and August. As great as cooling off in the ocean can be, however, we know that nothing quite beats a freshwater soak in a warm, clean lake to wash away the salt of a mid-summer multi-day kayaking adventure. 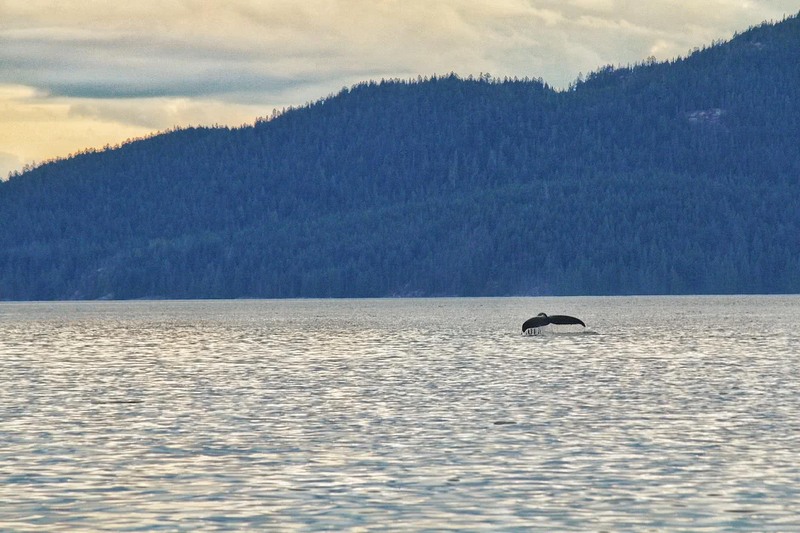 Check out these incredible freshwater lakes easily accessible from Desolation Sound, perfect for a quick dip or an entire day or rest and relaxation. 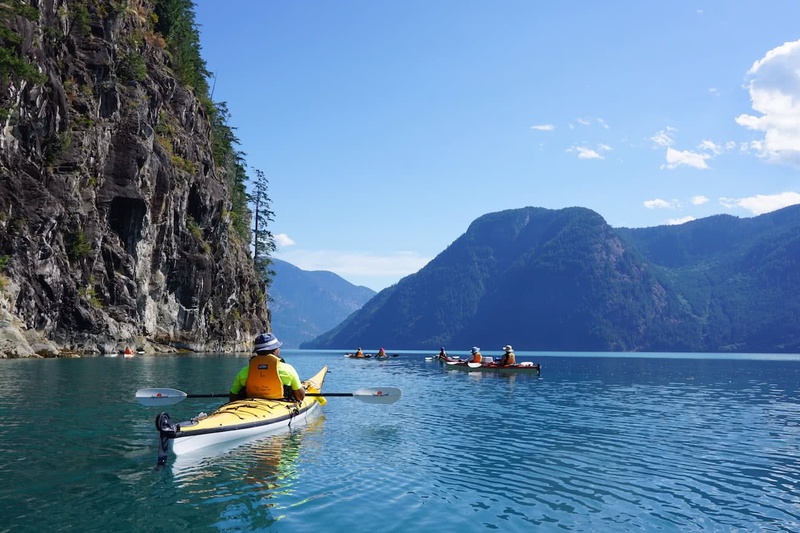 This one is famous – accessed from the pullout in Tenedos Bay, a mere 45 minute paddle from the Curme Islands – Unwin Lake is a popular and attractive day trip paddle from your base camp in the heart of Desolation Sound. From the campsite in Tenedos Bay, follow the trail for 10 minutes through an ancient temperate rainforest amongst humongous trees, and then choose your path to the left or the right hand side of the lake and find yourself a secluded corner to eat a lazy lunch, swim in the sun, or jump from a shoreline cliff into the warm water below. The trail from the bay to the lake itself is a wonderful experience, with a number of side paths that snake away from the main trail and bring you to the base of an ancient old-growth cedar or a secret corner alongside a babbling waterfall flowing from the lake into the bay below. 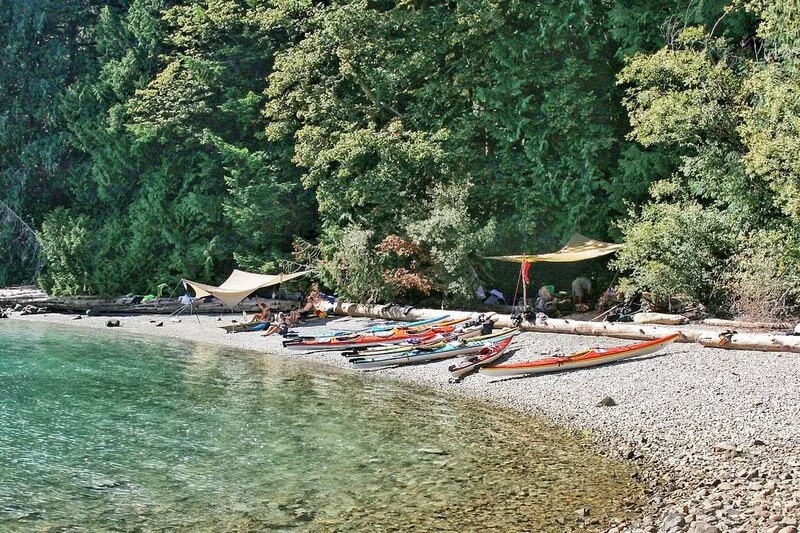 Camping nearby include the Curme Islands, Tends Bay itself, as well as Bold Head at the entrance to Tenedos Bay – all of which are located within Desolation Sound Marine park and include tent platforms, pit toilets, and basic backcountry kitchen and picnic areas. Another centrally located lake, Black Lake is found at the head of Roscoe Bay on the south eastern corner of West Redonda Island, about 90 minutes paddle from the Curme Islands to the south. Roscoe Bay itself is a beautiful, narrow fjord that is a popular anchorage in the summer months with sailboats and small yachts. At the head of the Bay is an easy landing at a small campsite with an obvious trail beside a rushing creek to the lake. The trail arcs off to the right hand side once you reach the lake, and splits off in a number of places to reveal secluded places for groups or couples to find some privacy and relax along the shoreline. Black Lake is probably the warmest of the lakes in Desolation Sound, and another perfect day paddle from a base camp on the Curme Islands. A short portage with empty kayaks is also possible along the flat trail, opening up even more potential exploration and adventure! 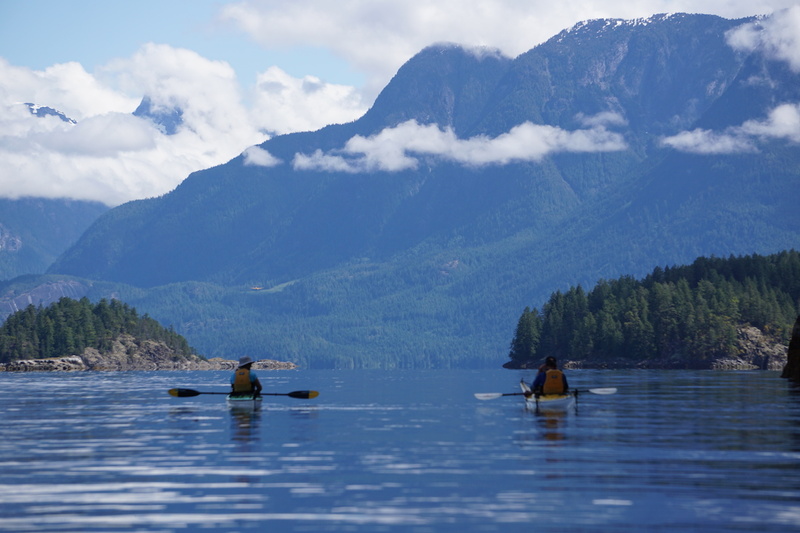 Little known to kayakers, but well known to summer hikers of the Sunshine Coast Trail, Wednesday Lake can be accessed via a 30 minute hike from Cochrane Bay in Malaspina Inlet, about 2 hours paddle north of our launch site in Penrose Bay. Paddle into the small pullout in Cochrane Bay and follow the trail to where it intersects with the marked Sunshine Coast Trail, where you can take a left turn and follow the trail in a southerly direction up and down for half an hour to reach the lake – perfect for a refreshing swim after some physical activity! Wednesday Lake is warm, clear, and remote – meaning that you will very likely have the entire place to yourselves while you are there, with the possible exception of the occasional through hiker on the trail. 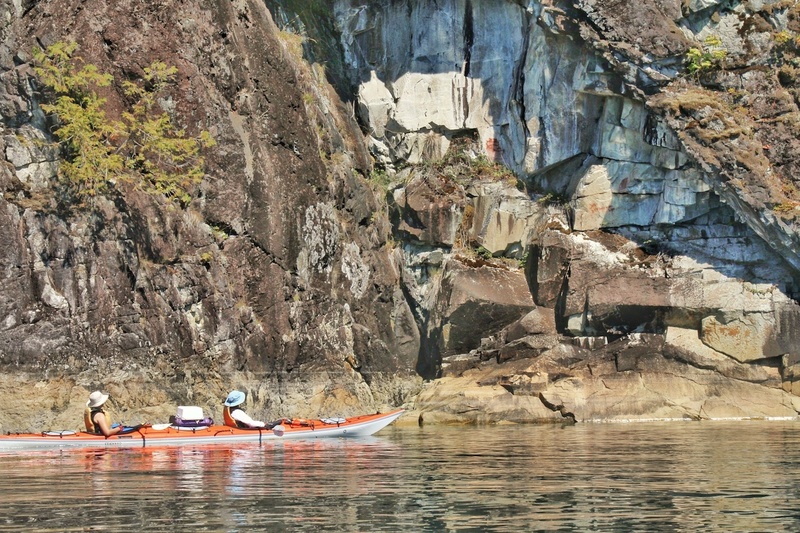 The lake is most easily accessed as a day trip from the campsites at Grace Harbour or Hare Point, about 30 or 40 minutes paddle from each, and is often used by kayakers as a great way to stretch the legs and embrace a different form of exercise during a sea kayak expedition in Desolation Sound.